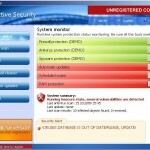 Active Security is a rogue antispyware program from same family as Protection System. Active Security is installed without user permission by using a trojan horse. When the rogue is installed it will be set to start automatically when Windows loads. 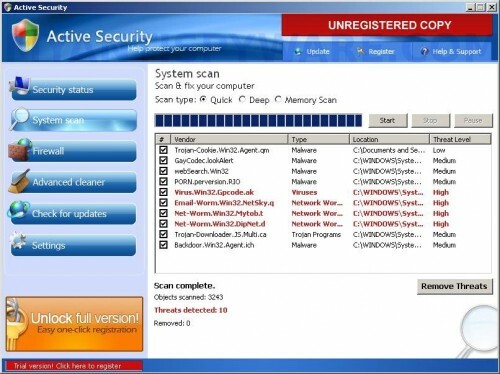 Once running, Active Security will begin to scan your computer and display scan results that state the PC is infected with numerous infections, in order to trick you to buy the paid version of the software. All of these infections are fake, so you can safely ignore them. When Active Security is running, you will be shown nag screens, fake security alerts, notifications from Windows task bar and other pop-ups. These alerts and warnings will suggest you purchase Active Security to protect yourself. Computer users are urged to avoid purchasing this bogus program! The program is designed only for one to trick you into buying the software. Instead of doing so, use these Active Security removal instructions below in order to remove this infection and any associated malware from your computer for free. Select Perform Quick Scan, then click Scan, it will start scanning your computer for Active Security infection. This procedure can take some time, so please be patient. Make sure that everything is checked, and click Remove Selected for start Active Security removal process. When disinfection is completed, a log will open in Notepad and you may be prompted to Restart. I keep getting an Error when trying to download Malwarebites…. Larry, probably your computer infected with trojan that blocks Malwarebytes Anti-malware. Ask for help in our Spyware removal forum. 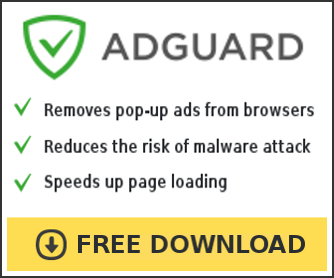 Can I learn how to remove the trojan virus that blocks Malwarebytes? I’m having the same problem. The Malwarebytes can’t be started. Jason, you need ask for help in our Spyware removal forum.